Nicole M. DeWitt, Esq. is an Associate in Frier Levitt’s Litigation Department. Her practice focuses in the areas of healthcare, pharmaceutical, and insurance law, representing clients in connection with healthcare and commercial disputes, as well as counseling providers on reimbursement, network contracting, and out-of-network issues. She also counsels clients and provides analysis regarding practice issues, including the enforcement of restrictive covenants. Nicole advocates for her clients in order to ensure optimum results for their immediate concerns as well as their long-term goals. 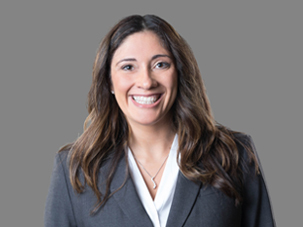 Prior to joining Frier Levitt, Nicole was an associate in a law firm handling health care provider reimbursement litigation in the Superior Court of New Jersey. She also settled countless medical provider claims in the New Jersey Division of Workers’ Compensation while dealing with the unique legal issues of medical providers rendering services to an injured employee. Before beginning her legal career, Nicole worked in the pharmaceutical industry as an Equipment Validation Scientist and Quality Assurance Supervisor at a manufacturing facility for a generic prescription medication provider.